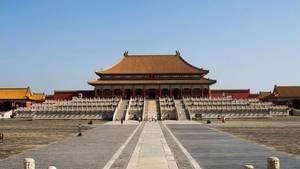 The Forbidden City was the palace of China's emperors for six centuries, from 1420 to 1911. 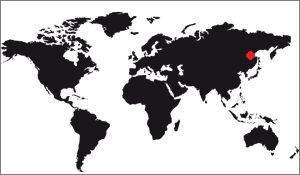 During this time they ruled their empire from their palace which is in fact a gigantic complex of administrative buildings or living spaces. 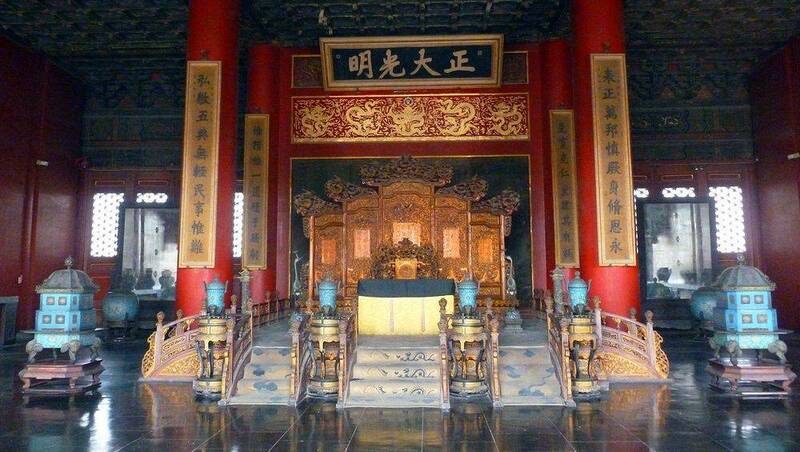 With so many pavilions the emperor needed several thrones. It is in the center of the room, at the top of a platform accessible through seven steps. It is surrounded by 6 pillars of thick lacquered gold adorned with dragons. Other dragons are carved in the golden throne. Around the throne stand two bronze cranes, an incense burner in the shape of an elephant and a tripod in the shape of a mythical beast. It is richly decorated with dragons, giving an aura of solemnity and mystery. The Middle Harmony Pavilion is the second palace in the outer courtyard, and is also the smallest. 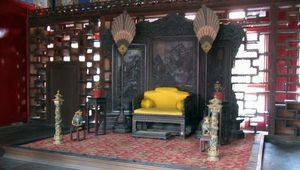 Simple preparation room, his throne was simpler, perched on a small platform of colors, it was a quilted bench of yellow installed before a screen richly carved. 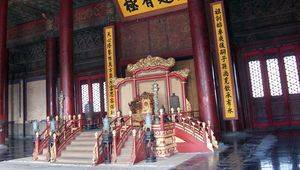 Four pedestal stands are in front, they are probably after the construction of the forbidden city. The Preserved Harmony Pavilion is the third palace in the outer courtyard. It contains another throne, much more modest than the others. Also made in the form of a bench quilted with yellow, it has a wooden seat sulpté of beauty. But this is again the screen behind that catches the eye, a beautiful red and yellow wood panel very worked. 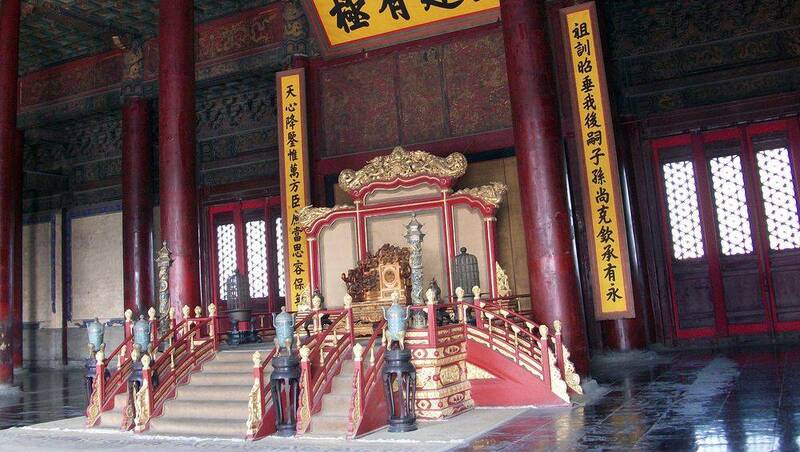 This more modest pavilion also has its imperial throne. 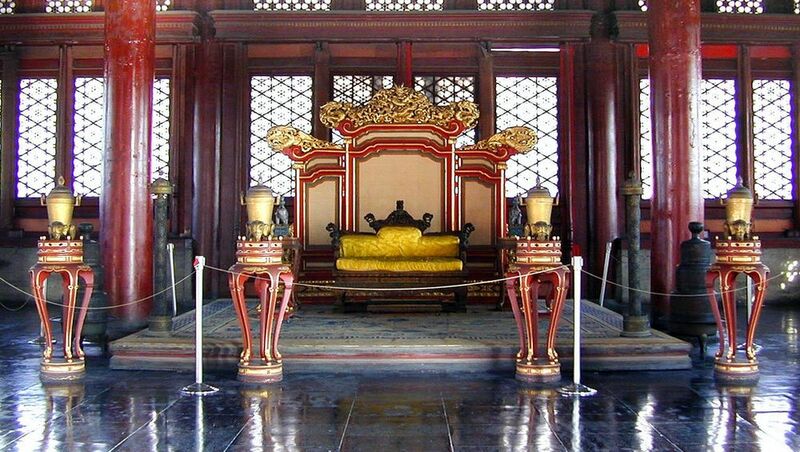 It is made of a simple bench covered with cushions with armrests, of yellow color of course (the color of the emperor). What is more significant is its screen, at the back, which is made of a dark wood and which is particularly worked. 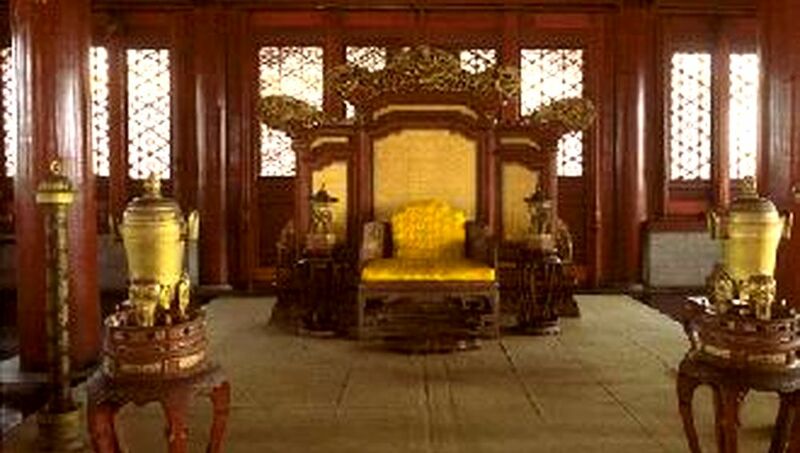 The throne in the pavilion of the Celestial Purity is very similar to that of Supreme Harmony, ie it is also supported by 4 pillars, on a platform with 4 steps (7 for the other), and it has a quilted yellow seat. 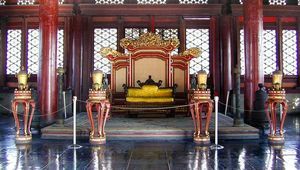 It is surrounded by incense burners, long red candles and large mirrors that have been placed next to the throne to ward off evil spirits. On the columns all around, there are two pairs of verses written by the emperors Qing . 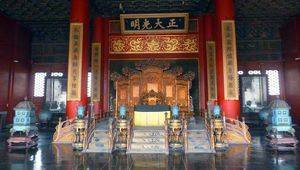 On the throne hangs a plaque engraved with four Chinese characters, written by Emperor Yongzheng and which means "justice and brightness". 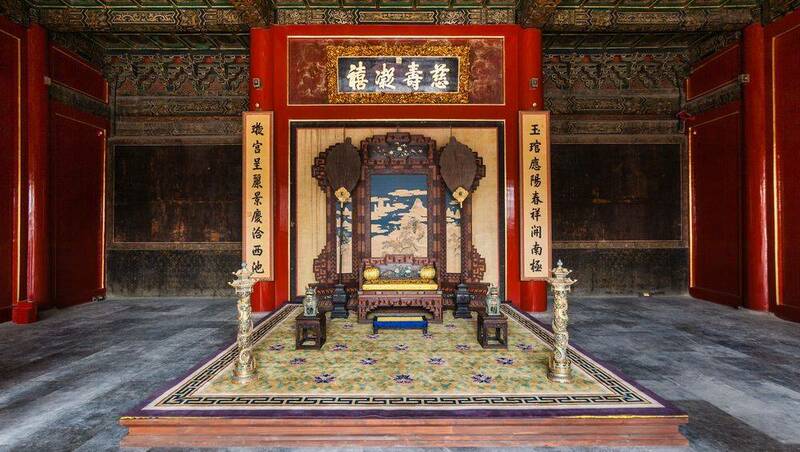 From the time of Emperor Yongzheng, the name of each Crown Prince was written on duplicate documents and a copy was placed in a box behind this plaque. The other copy was kept by the Emperor. The prince designated by these two copies had then the legitimacy of the succession of his father. If, unfortunately, one of the two copies did not conform to the other, the prince must be disavowed. This throne is in the Palace of Longevity and Health , the residence of the Empress Dowager. It was of course for the exclusive use of the emperor. 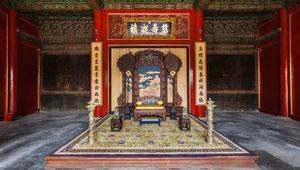 This throne is a little different from the others because it has a double screen of different styles: The first is made in a very dark wood that surrounds a beautiful typically Asian deep blue. The second is wide, rectangular, bright red. 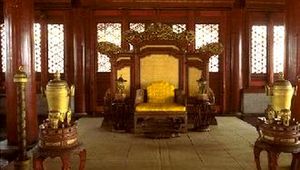 The throne itself is quite simple as usual: yellow cushions on a worked wooden bench.